Liverpool are through to the knockout stage of this season’s Champions League competition, thanks to Alisson Becker’s heroic displays against Napoli last night. Prior to the encounter, the Reds needed a 1-0 victory over the Serie A giants to progress out of the group. After many missed chances, the Merseyside outfits scored a very important goal via Mohammed Salah who had already missed a glorious opportunity to put the home side ahead in the first half of the encounter. All of Liverpool’s efforts to double their lead were unproductive, instead, it was Napoli who came close to grabbing an all-important equalizer. Arkadiusz Milik almost found the back of the net from close range, but Alisson Becker’s mighty hands were enough to prevent the former Ajax striker from sailing through to the bottom corner. The 26-year-old goalie started his career in 2002 at the age of 10 when he joined Inter Milan’s academy. The Brazilian progressed through the ranks until he made his first-team debut when he was 21 years old. At first, he was a backup to Muriel but he began to feature more constantly with the Serie A giants as time goes on. Alisson had 100 appearances for the Ammazurris in all competitions before he joined Roma. Despite Juventus interest in his signature, the Brazilian international decided to join Roma in 2015 but the Serie A side rejected Alisson’s ‘come and get me’ plea. Walter Sabatini who was Roma manager in 2015 failed to complete Roma’s move for the goalkeeper due to some crises related to EU qualification. 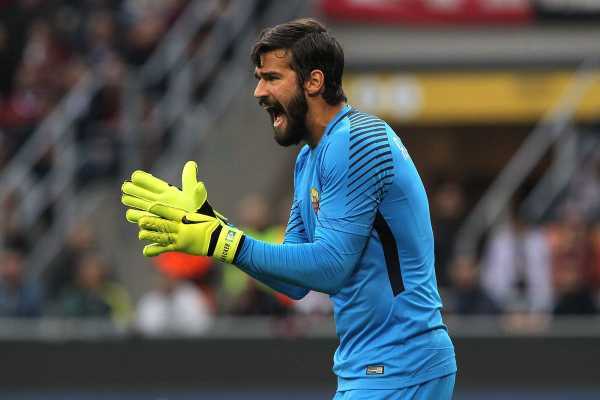 After one season, Alisson’s longtime dream eventually come true as he was signed by Roma in 2016. He went on to appear in just 37 matches after two seasons. With just 37 matches, the goalie was able to capture Klopp’s attention with some important match-winning saves. It took the Reds to break the world record before they could force Roma into sanctioning his move to Anfield. The Reds paid €72m for his signature during the summer transfer window. The goalie’s rise to stardom happened within a short period of time, though, he passed through some career-threatening challenges and rejection. His switch to the Anfield stadium was marred by the huge amount received by Roma on his signature. However, the Reds are presently enjoying the services they are getting from the netminder. He has been wonderful at the back of the park since the start of this campaign. At 26, Liverpool are yet to reap half of their reward for spending big on the Brazilian star, who has become a mainstay in Klopp’s starting lineup and even in the League.